The Trasimeno Music Festival is over for another year. It’s such a special week that it’s very hard to explain it with words if you haven’t been there. The beauty of Umbria, the wonderful venues we have for our concerts, the camaraderie between members of the audience, the joy of the artists who come to perform—all of that makes for something which is quite far removed from ordinary concert experiences. I will never forget playing Book I of Bach’s Well-Tempered Clavier in the Basilica of San Pietro in Perugia with the piano placed in the centre of the nave, with the audience in a semi-circle around me, and a beautiful painting of the Crucifixion behind me. That was one of the most moving concerts of my life. Of course Bach had a lot to do with it! That final B minor fugue is out of this world, literally. Bravo to all the artists who performed, to Sir Richard Eyre who gave us such wonderful insights into his life and work, and to the staff who helped me organise the whole thing. I hope many of you will come next summer (June 29 to July 5, 2019). The only way we can keep it going is if we have a sufficient number of people who come for the whole week and help us with the generosity of their donations. Today I rehearsed Messiaen’s huge Turangalila Symphony with the BBC Symphony Orchestra, ondes martenot player Cynthia Millar, and conductor Sakari Oramo. That was a thrill! Our performance is in the BBC Proms at the Royal Albert Hall on Wednesday night. Tune in HERE to listen live on BBC Radio and the internet. It will stay in the archive for a month. What a lot of work to re-learn it (I haven’t played it in three years), but I adore it. 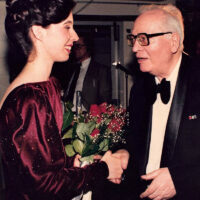 I first played Messiaen age 15, and then he and his wife, pianist Yvonne Loriod, were on the jury of the 1985 International Bach Piano Competition in Toronto which launched my career. Meeting them then was one of the highlights of my life (see photo). Madame Loriod had the publishers send me the score of Turangalila, and I treasure the letter she wrote me in 1999, saying how much they had admired my playing and how great it would be if I played Turangalila. Next week, on July 26th, I have a birthday—one ending in a zero. Oh dear!! Well, what better way to celebrate than to play Bach’s Goldberg Variations in London’s Wigmore Hall—where I have performed for the past 33 years. A birthday is nothing without music!